Mesos is the digital currency used in the game MapleStory M. You need it for basically everything in the game. For instance, Mesos can be used to upgrade your armor, weapon, jewels and buying useful items in the game. We have millions of mesos in our MapleStory M game. In this blog you will read our tactics for farming MapleStory M Mesos fast. You also read about the best way to buy this currency online. Some people just do not want to grind for days to get millions of in-game currency fast. Cheap mesos can be bought for a small amount of real life cash. We will kick this blog off with our tips of gaining mesos for free. We use these top 5 mesos farming tips to gain the maximum of this currency each day. Daily Missions: You will get new missions every day. Complete all of them to get 120k mesos daily. This will add up very fast. Mini Dungeons: At level 100 it is possible to farm between 150k–200k. Farm each those dungeons for 30 minutes. Trade weapons: In the trading section you can sell perfect attack weapons for over 1 million mesos. You will need to get a perfect base attack weapon to sell first. Keep an eye out for those! You can buy MapleStory M Mesos online at our favorite vendor Aoeah. They will deliver fast and are your cheapest highest quality MapleStory M Mesos vendor around. 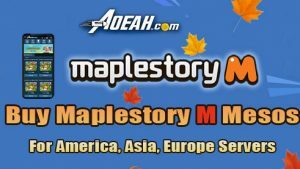 Previous: What is MapleStory M?